In the Science & History Division on the 3rd floor of the downtown Bausch & Lomb Public Library is a rich resource of books, magazines, maps and primary resources: the Vietnam Learning Center. Recently, I met the Center’s manger, librarian Steve Nash. 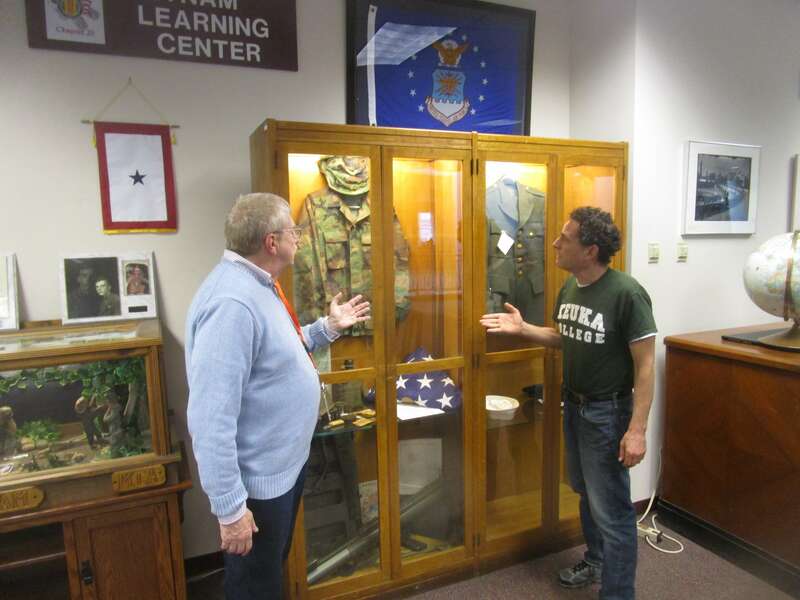 Himself a Vietnam era veteran–having served ten years in the Army Reserves–for Steve the Center is more than a job. In many ways, the Center is his mission. Steve explained that becoming VLC manger was unplanned — just serendipity. For those who use and enjoy the Center, that good fortune is also ours. 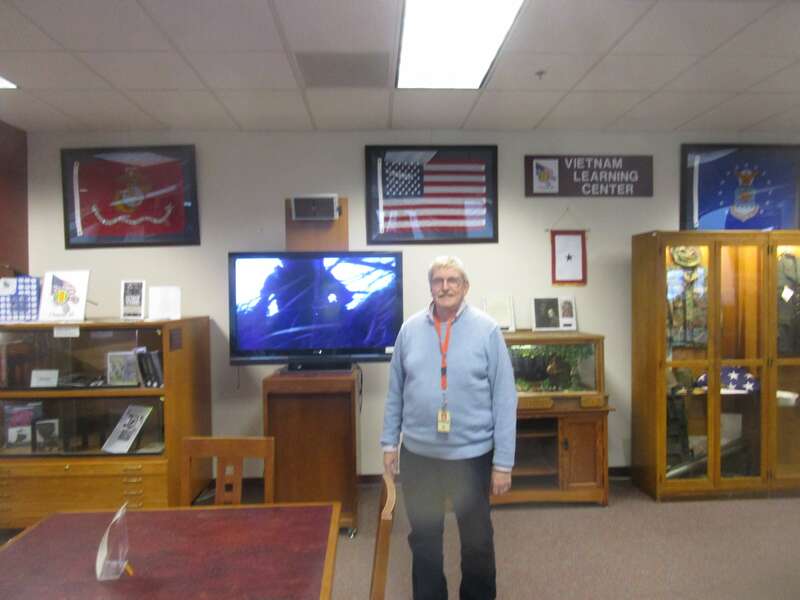 Thanks to a generous grant from the Vietnam Veterans of America, Chapter 20, a few years ago, the library was able to establish this center to inform and educate the public and not let the Vietnam War be forgotten. Seating is available to watch news documentaries of the era and U.S. military combat films. Original maps of battles and military bases are readily available to view. 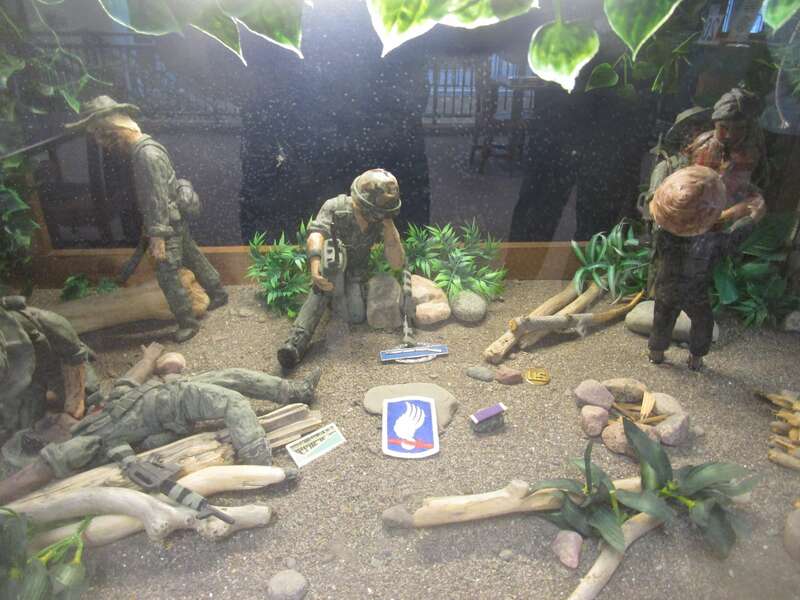 Visitors can look at diorama built by a vet [featured photo] and a display of uniforms and equipment. I manage the Vietnam Learning Center. 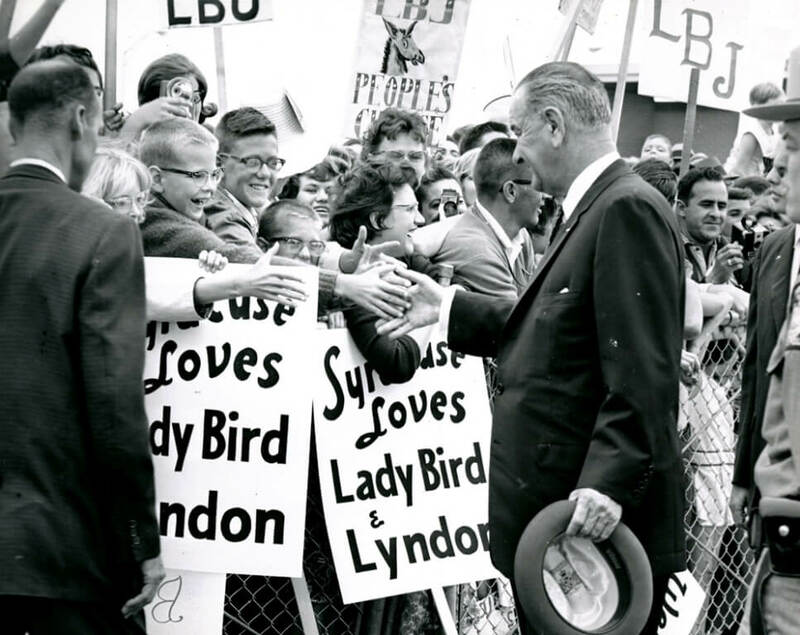 When I was a young teen, growing up in Syracuse, in August 1964, President Johnson came to dedicate the Newhouse School of Communications, located on the campus of Syracuse University. I was invited up to campus to hear the President speak by my mom who was a secretary at SU. After speaking about the importance of education, the President’s remarks took on entirely different tone and message. Just days before the speech, a US Navy destroyer had been fired upon in the Gulf of Tonkin by the North Vietnamese. Little did I or anyone in the audience at the time realize the historical significance of the speech. Just a few days later the “Gulf of Tonkin Resolution” was passed by the U.S. Congress, which gave President Johnson authorization, without a formal declaration of war, to greatly increase America’s involvement in Vietnam. After graduating from high school in 1966, I received a tuition scholarship to attend Syracuse. During my time in college as the war raged, anti war protests increased, and the war affected each person in my generation. The war hit home as one my good high school friends was killed serving in Vietnam and my cousin was killed as a result of “friendly fire.” Just before my graduation in 1970, I enlisted in the Army Reserves and eventually served ten years. I was ready to serve if called upon, but the trend then was to rely on the draft and not call up the reserves. I received a Masters in Library Science from SUNY Geneseo. and was hired by Greece Central as a school media specialist teacher. I chaperoned a number of 8th grade student field trips to Washington, D.C. We would go to the Vietnam Veterans Memorial and I, along with my colleagues and students, would quietly and respectfully make rubbings of the names of family or friends whose names were on the wall. I would heartily encourage you to visit the Vietnam Learning Center at the Central Library. Please call 428-8110 if you have a question, would like a our flyer, or if we can be of any help. Please contact if you wish to donate books and materials related to the Vietnam War. The times I have been at the Center the couches and tables are usually used. I have seen people intently watching the continuous videos of a bygone era in a foreign land. No doubt, some of the viewers were there themselves. No matter how the Center is used, the Vietnam War will not be forgotten.